I’ve quoted that verse to others and, quite a few times, to myself. Most often it’s to answer the question why didn’t things turn out the way we had hoped. When we face disappointments like that, one area of our life that can take a blow is our passion. I’ve found when my passion and energy are running low, a few bold moves need to be taken. Now, apart from the obvious… we need to be on our faces before God, we need to establish a laser focus so we aren’t spreading the energy and enthusiasm too thin and zapping our own passion. I love to white board. But, when you’ve gone over an idea or project so many times and there’s crazy arrows and asterisks everywhere, and it doesn’t make sense anymore, it’s time to wipe it clean. Then repopulate your time and energy accordingly. Having short term, attainable dreams is very motivating, and requires less energy than long term visions. Leaders are overwhelmed most of the time. Because of that, it’s easy to become ladened with tasks that could be delegated. Look at your schedule and decide what areas need to continue, but another person could take on short term… or even permanently. Then, while looking at that list, find one that doesn’t really need to happen, and just stop it. I said these were bold, so…stop it. It should be something that isn’t really fruitful, and seems to drain you when it needs to be done. This needs to be something small (it could grow) but has to be outside of all the things you already do. If you don’t exercise…start. Master a new subject, start a wacko hobby, paint a picture, collect coins, become an expert on Samurai swords or Light Sabers…whatever. 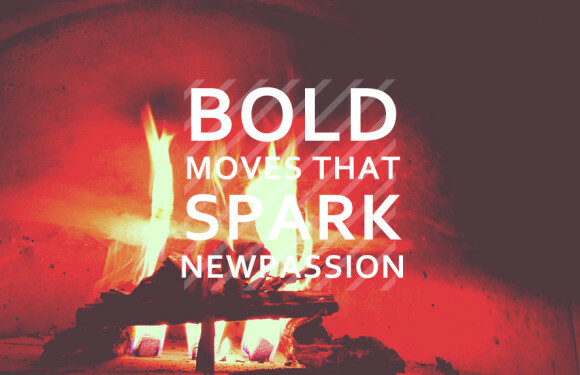 Once your passion is critically low or almost gone, do whatever it takes to bring the spark back…Make a BOLD move! If you’re running low and need someone to pray for you…I will. Let me know in the comments or tweet me!